Rimicaris exoculata, the eyeless vent shrimp is an iconic member of hydrothermal vent communities on the Mid-Atlantic Ridge. 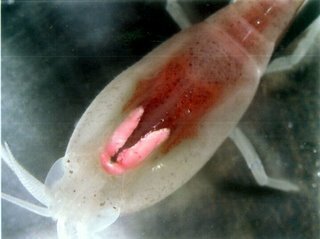 The shrimp is characterized by a lack of eyes, an enlarged carapace, chemoautotrophic symbionts that they farm in their gills, and, most curiously, large photoreceptors on the top of its carapace. A solution to the mysterious eyespots was first hypothesized by Cindy Lee Van Dover, who inferred that Rimicaris exoculata can “see” low﻿-level light produced by hydrothermal vent effluent. Iconic, novel, biologically fascinating; of all the adjectives I can think of to describe Rimicaris exoculata, the one that jumps immediately to mind is sort-of-canoe-shaped. In fact, it’s so sort-of-canoe-shaped that this hydrothermal vent shrimp needs to have a canoe made in its image. Presenting the grand unveiling of Project S – the Rimicanoe (sensu strictissimo Rimicaris exocu-yacht-a)! Project S revealed! The Rimicanoe!